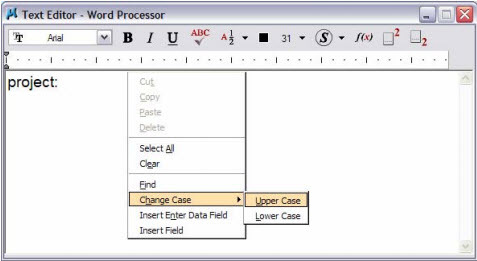 MicroStation V8i has added a Change Case selection to the right click menu in the Text Editor – Word Processor dialog. Simply right click in the text area of the dialog to display the menu then select Change Case and desired case setting. Change Case uses the Apply changes to all text option in the to Tool Settings window. If the apply changes option is off Change Case will only operate on selected text.